Do you ever get yourself into a situation, and wonder how on earth it was that you ever agreed to get involved in the first place? This time last week, that was me. You may have noticed (from the distinct lack of personal photographs on the blog) that I’m not a particular fan of having my picture taken. So how was it that I agreed to be photographed last Monday morning wearing a pair of overalls, sitting in a knitted (yarnbombed) wheelbarrow, clutching a live chicken? Let me tell you about the Less is More Festival. It’s a free community festival in Perth that I’m organising that is happening in February next year. It’s a day of skill-sharing workshops and presentations designed to encourage and promote conscious living and sustainability; to inspire, motivate and connect like-minded people in the community. The full line up of presenters is yet to be confirmed, but we have talks on a number of topics including gardening, food, health and mindfulness. I co-ordinated the Festival earlier this year, and had such a great time I decided to run it again next year. This will be the third one. I didn’t come up with the idea – that was Claire Litton, who took part in an Earth Carers course (the team that created Plastic Free July) and was inspired to give something back to the community, and so created the Less is More Festival in 2012. She then left Perth to move to Canada, and that’s when I became involved. My personal reasons for getting involved are because I love having the opportunity to give something back to my community, and also be able to inspire others to make more sustainable lifestyle choices, learn new skills, and connect with like-minded people. The Festival is run entirely by volunteers and all the presenters generously donate their time, so it is able to run with a minimal budget. It is also free, so we can be accessible to as many people as possible. 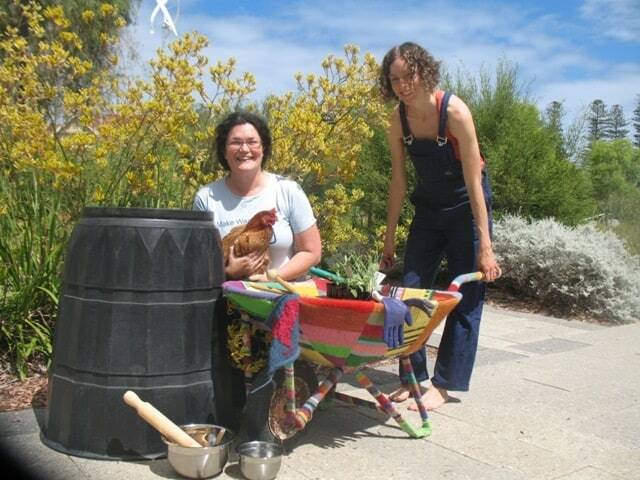 The Earth Carers generously support the Festival, and have done since the start. Which leads me back to the photo shoot. The Earth Carers thought it would be great to have some crazy pictures to help promote the Festival around their networks, and that is why I ended up sitting outside the library on Monday morning attracting strange glances from passers-by. The Earth Carers love a chance to dress up (whether the occasion calls for it or not! ), and Gabrielle ended up climbing into a compost bin beside me for the pictures. Love this idea, well done for coordinating it! I wish I had the energy to do something like that. Awesome Lindsay, you beautiful thing! Me and Ads are super excited about presenting. We hope to have some yummy home grown bananas for tasting!